Hello, friends, and welcome to episode number seven of The Greg Amundson Show. Tonight we have a special edition show for you, my friends, and I am thrilled about the message and about the two stories that I have for you. Let’s get right down to business, my friends. Here we go! Many, many years ago, there was an innocent man who was wrongly convicted and sentenced to a life of imprisonment. On the day of their sentencing, the jailer took custody of this innocent man, led them down into the depths of the castle dungeon. Once they approached the cell, this jailer threw the innocent man into his cell and then abruptly closed the door. There this innocent man sat, lost in the sorrow of his own thoughts. Days and days, weeks and weeks, months and months, years and years went by, and the only contact with the outside world this innocent man had was with the same jailer who locked him up on the first day of his life sentence to imprisonment. Every day that jailer would come and give him a loaf of bread and a bowl of water. That was the only contact this innocent man had with any other human being. And this innocent man became so depressed that he began to consider taking his own life. Yet, his moral conviction would not allow him to commit suicide and so he devised a plan that the next time the jailer came to feed him a loaf of bread and a bowl of water, he would attack the jailer in hopes that the jailer in self-defense would kill him, putting him out of his misery. And in that state of great depression, great sadness, he walked up to the door, put his hand on the door and, creak, much to his surprise and delight, the door to his jail cell opened. Now open closer inspection of the door that had been closed, he realized there was no lock on the door at all. He’d been imprisoned for nearly 20 years with a jail door that did not have a lock on it. Now this man is standing in the hallway of the dungeon. He looks to his right. He looks to his left. There’s no jailer in sight. And off in the distance, down the hallway, he sees that the stairway that 20 years earlier he had been led down on his first day of confinement. He walks to that stairway, nervously looks up and there is no jailer. He walks up that staircase to the foyer of the castle grounds and there is no jailer. He looks and sees the gates, the drawbridge, the moat that leads to freedom and once again, there is no jailer. He walks across the drawbridge into a life of happiness, joy and freedom. Wow, what a story with so many layers of meaning and message. Now, my friends, as we learned on a previous episode of The Greg Amundson Show called The Art of the Story, what steps we take when we hear a story are extremely important. One of those steps is listening to the story and assessing which of the characters we are. So my friends, as you listened to this opening story, who are you as you hear, as you listen, as you contemplate, as you receive this message, this story? Who are you? Are you the jailer? Are you the man wrongly accused? Are you the jail cell itself? Are you the door? Are you the bridge? Are you that beautiful pasture of freedom the man ultimately walks into? Who are you as you listened to the story tonight? And that’s such an important question to ponder when we hear a story because what the story teaches us is how we can experience life. In any given moment of our life, we can contemplate what role am I playing right now? And ultimately, it comes down to two roles. Am I playing the role of the victim in my own life or am I playing the role of the victor? Who am I as I walk out the door of my own home? Who am I as I experienced the quality of my day? Am I the victim or am I the victor? As anyone who’s studied the brilliant work of my dear friend and long time mentor, Mark Divine, I’m simply paraphrasing the great question he asks his students to contemplate: What dog are you feeding right now? Are you feeding the dog of fear in your life or are you feeding the dog of courage? And in both of these questions, “What role are you playing? What dog are you feeding?” what we realize, my friends, with a great deal of gratitude is that ultimately, the choice belongs to us. You see, that man had been locked in a jail cell without a lock on the door to his own imprisonment for 20 years. That means at any given moment of his sentence, he was ultimately free to go. That’s the nature of our mind. Our mind can either keep us in some degree of captivity or it can release us into the greatest realm of freedom that our heart has ever desired. The choice is ultimately up to us. What role do we want to play? What dog do we want to feed? There’s this beautiful Bible verse I really want to share with you tonight. Jesus said, “Blessed are they which do hunger and thirst after righteousness for they shall be filled.” Now, righteousness is a key word in the Bible. Righteousness in the Bible means nearly not right conduct but right thinking on all subjects in every department of life. 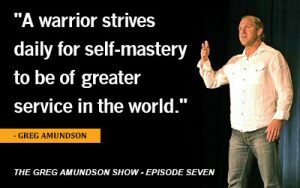 That’s so important to understand because what that means for the modern-day warrior is it’s just not the quality of our actions which define the man or woman that we are; it is in fact the quality of our thinking. Righteous means right thinking, the ability to conduct business in the temple of our own mind, which is ultimately a private place. Yet, nevertheless, within that privacy, we have to keep that temple clean. Now what it says is really special. It’s saying, “Blessed are they which do hunger and thirst after righteousness for they shall be filled.” So, my friends, consider this. The great law of the universe is that whatever you think about in your mind, you will produce in your experience. As within, so without. You cannot think one thing and yet produce another. Listen to that one more time because it’s so important to understand. You cannot think one thing and produce another. Everything that you’re producing in your life is a result of the quality of your thinking, which means that everything that you are experiencing in your life in this moment, you thought into existence. Wow. How empowering is that? That means, my friends, that in any given moment of your life, you can begin to garden and tend to the soil and the quality of the seeds that you are planting in your life. If you want to experience a great harvest, then take time now, today, in this moment to begin to plant this seeds of you desire. Where are those seeds planted? In the temple of your mind. Now, the good news, it says, is that when you really hunger, and when you really thirst for righteousness, which means right thinking, when that becomes the desire of your heart, when you are hungry, when you are thirsty, when you are starving to feed yourself with the right quality of nutrition, with the right words, with the right thoughts, you will be blessed. You will be fulfilled. So the effort that you put in will be perfectly matched by the product, by the end result of how much effort you are putting into your practice. That’s such a beautiful concept to hold onto. When my friend Mark Divine and I teach on this subject of feeding the dog of courage, this really becomes a significant point of blessedness for the modern-day warrior. For those of us who are stepping onto the path, what it’s saying is that the time that you take to feed the dog of courage is time well spent. The Bible is affirming that effort that we put in. It’s saying blessed are you who feeds the dog of courage for that dog will be fulfilled. Your life will begin to reflect the fact that that is the dog that you’re feeding. When you commit to being the victor of your own life, when you are victorious in your mind, that effort that you produce in the mind will be experienced in the quality of your life. Wow, what a blessing. There’s so much joy to be found in that. There’s so much joy to be found in that. My friends, the reason this is a special edition is that this show exists in between our regular scheduled show, which is the first and third Sunday of every month. The reason for the special edition show is to really drive home a point, a point that can make a profound difference in your life. And what you’ve got to understand about making a difference in your life is that a very small degree of change in your life over time can produce the most radical effect. I mean, consider this: if a plane leaves New York with a destination of San Diego, California, yet that flight path is off by one degree, the plane ultimate lands in San Francisco, which is nearly 800 miles away. So as that plane travels across the country, the one degree change, which seemed insignificant, over time becomes extraordinarily significant. That is the impact that a small daily change in our life can have over time. What I’m here to share with you, my friends is that the daily practice of bringing awareness to the quality of your thinking is time well spent. And we’re finding affirmation of that in the Bible. In the Bible, Jesus is telling us, “Blessed are you that takes a daily inventory of the quality of your thinking because you will be blessed.” You will experience blessedness in your life, because you are taking the necessary time every day to hunger and thirst for righteousness, for right thinking. So we find affirmation, we find confirmation, we find assuredness in the Holy Bible that this practice that we’re adhering to of right thinking, and therefore right speaking is time well spent. Wow, I just love that. I love that the Bible can confirm for us that we’re doing things right. We’re on the right path. What a great source of affirmation. When the Bible is affirming that what we’re doing is right, I take great delight and comfort in that. My friends, I’ve mentioned on numerous occasions one of my mentors who is sadly no longer with us, Ken Gray. Such a remarkable man. The heart in this man, oh my goodness. I wish he was still alive. I would have him as a guest on this show. Even the sound of his voice brings comfort and joy. Oh, I miss Ken so much. Ken was a real man of theology. He loved to study the history of the Bible, and he loved to look at how different cultures shared stories from the Bible. I was raised Catholic and one of my favorite stories in the Bible is when Moses parted the Red Sea. In the Catholic faith, the way I heard that story told from Father Michael Kelly, of Presentation Church in Stockton, California when I was a very young boy, is that Moses stood on the shore and with his staff in hand, said: “Part, you seas!” And immediately, the seas parted. And I love that version of the story. That there was so much authority and righteousness in the words of Moses that the sea immediately adhered to what he said. He spoke and the seas obeyed. He spoke, God heard, and a miracle was performed. I just love that version of the story. Many, many years ago, Moses stood on the seashore. Thousands of his people were dependent upon his ability to perform a miracle because an army was raging down on top of them set on murdering every single one of them. They were essentially defenseless, and dependent upon one person, Moses, to save their life. Moses stood on the seashore, before the sea. With his staff in hand, he raised it overhead and he said, “Part, you seas!” And nothing happened. Then Moses took a few steps into the sea, the water up to his ankles. Moses raises his staff overhead once again and says, “Part, you seas!” And nothing happens. Moses now walks into the sea up to his knees, raises his staff overhead, and with a bit more authority and conviction in his voice, says, “Part, you seas!” And nothing happens. And now, his people are beginning to get a little bit nervous because the army is rapidly approaching. Moses goes into the sea up to his waist, raises his staff. “Part, you seas!” Nothing happens. Moses goes in the sea up to his chest, raises his staff, says, “Part, you seas!” Nothing happens. Moses goes in the sea up to his neck. He tilts his head back, raises his staff and says, “Part, you seas!” And in that moment, the seas part. Wow, isn’t that amazing? What an interesting way to share the story. And my friends, the reason I love that version of the story is that that’s been my life experience. And perhaps that’s your life experience as well. It’s not the first iteration nor the second nor the third round of prayers or affirmation or mantra or conviction that we make. Oftentimes, it takes numerous attempts, numerous prayer requests. However, what Moses did is he retained faith. He continued to walk forward, he continued to maintain faith in God to hear his prayer, and he continued to keep his prayer in the positive tense. Always affirming, “Part, you seas” always walking forward in faith, always trusting God to hear and answer his prayer. So my friends, tonight, the challenge that I place before you is this: Take a moment after this show concludes to take inventory of the quality of your life right now. What aspects of your life are you extremely grateful for? What are you extremely grateful for? What do you feel so blessed to have received in your life in this moment? The reason we’re taking inventory for those qualities of our life which we’re desirous of and thankful for is that means that at some point in our life, we must have planted the right seed. So we’re grateful for the fact that we’ve created a condition in our life that we are now grateful for. The next step takes the courage of a warrior, because the next step requires us to take inventory of an aspect of our life which we are not desirous of. And we have to have courage, my friends, because what we must realize is that in the same manner that we thought a condition into our that we are grateful for, well, if we take inventory of some aspect of our life that we are not grateful for, that we are no longer desirous of, we have to understand that at some point, we must have planted seed that was incorrect. We never wanted to reap a harvest from that seed. Yet, nevertheless, we planted that at some point in our life. And now we’re experiencing the result of that quality of thinking. Well, here’s what we do now. We take that seed and we dig it out of the garden of our mind. Then we plant the seed that we are desirous of reaping. What do we want to harvest? What is the equal and opposite condition of what we’re no longer desirous of experiencing. We plant the seed that we do want. And here’s where all the stories begin to tie together. When we assess the quality of our life, when we take inventory and we realize, “Wow, I’m no longer desirous of experiences I never wanted to experience this in the first place.” In that moment, we are that innocent man locked into the jail cell, yet the door is unlocked. That’s the realization, is that in any given moment, we can open that door. We’re only hostage to our own mindset. When we set our mind on something that will free us, that door opens and we can step out into complete freedom. Then, once the correct seed is planted, we maintain faith. We maintain faith in ourselves and most importantly, we maintain faith in God, that the quality of every seed that we plant will be harvested. We will ultimately experience everything in our life that we are now thinking. So my friends, I want you to hunger and thirst for right thinking. Begin today. Begin right now to feed that dog of courage in your life. Begin today to be the victor in your own life. Begin today to really desire righteousness, right thinking, with the assuredness that you will be filled. Well, my friends, I pray that God will bless you and watch over you and keep you safe, and until the next time we meet, God bless you, take care, and I’ll speak with you soon right back here on The Greg Amundson Show. Take care.